Participation des Vignobles Mayard à Prowein 2010, Düsseldorf. 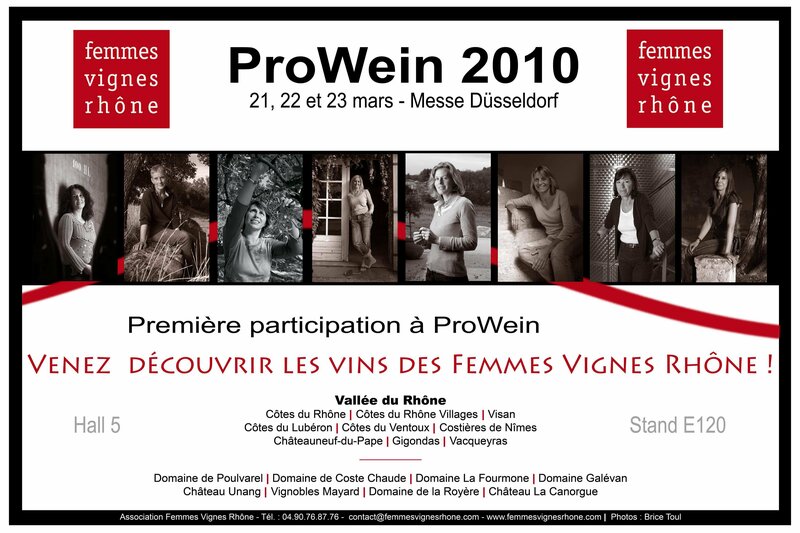 Les Vignobles Mayard participent cette année encore au salon Prowein 2010. Satisfaits des contacts établis lors du précédent salon, nous réitérons l’expérience cette année avec les Femmes Vignes Rhône. Le dynamisme dont fait preuve cette association et la qualité des vins qui sont proposés devraient à n’en pas douter, marquer les esprits. Si vous souhaitez recevoir une invitation pour venir nous rendre visite, n’hésitez pas à nous contacter. Nous serons à Düsseldorf les 21, 22 et 23 Mars 2010 sur le stand E120 dans le Hall 5. Participation des Vignobles Mayard au salon Vinisud 2010. Les Vignobles Mayard seront présents lors du salon Vinisud les 22, 23 et 24 février 2010 au Parc des Expositions de Montpellier. Nous y participons dans le cadre de l’association des Femmes Vignes Rhône. Notre numéro de stand est le D76 dans le Hall 11. Nous vous attendons, venez nombreux ! Dégustation verticale des vins des Vignobles Mayard par Josh Raynolds de chez Tanzer. Deep red. Exotically perfumed bouquet of spicy red berries, cherry, minerals and roses; smells like Burgundy. Pliant and sweet, with light-bodied, mineral-driven redcurrant, raspberry and blood orange flavors and no obvious tannins. Finishes clean and gently sweet, with the mineral note repeating. Ruby-red. Pungent cherry and blackcurrant aromas are underscored by smoked meat and herbs. Bitter cherry on the palate, with an amaro-like quality building on the close. Will this become sweeter with some additional bottle age? Medium red. Fresh strawberry and raspberry on the nose, with subtle cinnamon and blood orange qualities adding interest. Tangy red fruit flavors are sharply focused and a tad dry, but this has good finishing lift and crispness. This extremely youthful wine should fill in with a little patience. Bright ruby. Fresh, mineral-accented red berry and cherry aromas, along with dusty mineral and dried floral qualities. Dry and firm, with slow-opening red fruits and solid tannic grip. Not giving up much right now. Deep ruby. Dark cherry and plum on the nose, with smoked meat and licorice building with air. Firm dark fruit flavors could use a bit more flesh to counter the slightly dry tannins. Dark red. Dark, earthy aromas of cherry compote, smoked meat, licorice, bitter chocolate and espresso. Rich and full on the palate, the smoky and earthy qualities repeating. A powerful if somewhat rustic style that will merit a higher rating if it mellows by bottling time. Light ruby. Wonderfully perfumed, complex aromas of red and dark berries, mace, fennel, magnolia, rose oil and cured meat. Incisive and crisp on the palate, with the fresh red berry fruit taking center stage; accents of licorice and baking spices. Finishes silky, sweet and long, with noteworthy clarity. Bright violet color. High-pitched, floral aromas of crushed dark berries. Suave and supple, with an enticing sweetness and graceful berry, cherry and garrigue flavors that build impressively through the finish. Lovely, balanced wine. Deep red. Ripe red berry and cherry aromas are complicated by roasted coffee, graphite and licorice; showing more warmth than it did on release. Broad and fleshy, with deep red and dark berry flavors, supple tannins and slow-mounting minerality. Showing a lot of typical 2003 character but not at all heavy. The mineral note adds energy to the finish, which is nicely focused and persistent. This is drinking well now. I scored it 90(+?) on release. Ruby-red. Rich kirsch, tobacco and dried flower scents. Spicy, well-defined cherry and blackcurrant flavors gain sweetness with air, picking up gentle tannins. The finish is juicy and persistent, betraying no rough edges. This will be delicious young. Bright red. Highly aromatic bouquet of raspberry, cherry-cola, dried rose and allspice. Fresh, suave and pinot-like, with excellent precision to its red berry and spice flavors. The clear finish features lingering sweetness. Deep red. Explosive bouquet of lavender, rose, raspberry and strong smoky garrigue Sweet red berry flavors are complicated by musky herbs, with an exotic floral pastille quality gaining power with air. This very seductive and pliant wine finishes with very good clarity and sweet persistence. ($45) Ruby-red. Pungent aromas of cherry, dark berries, smoked meat and licorice. Sappy, sweet dark berry flavors are deep and energetic, offering a velvety texture and gentle mineral lift. Suavely mixes power and briskness, finishing sappy and long. This is balanced to age.